The spring equinox technically doesn’t come until March 20, but Pensacola is typically blessed with spring-like weather by around mid-February, giving the area a jump on the season. Indeed, this is one of the best times of the year to visit the Pensacola area, with temperatures often warm enough to enjoy outdoor activities and a number of great events that you won’t want to miss. 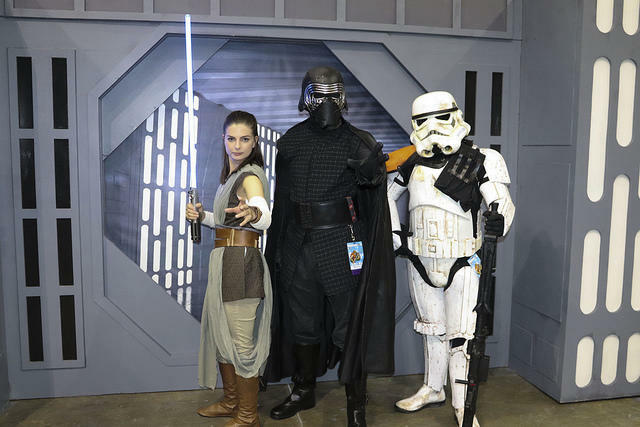 The weekend also features panels and workshops, a galaxy of vendors, gaming, live performances, a huge costume contest and a full program of after-hours events including a Friday night street party, as downtown’s monthly Friday night Gallery Night takes on a Pensacon theme. There’s barely a moment to pause after Pensacon, as Pensacola’s Mardi Gras season, which is already under way, culminates in a weekend of parades and partying ahead of Fat Tuesday. Three parades roll through the streets over the March 1-3 weekend. The good times start to roll with the area’s only evening parade, the Krewe of Lafitte Illuminated Mardi Gras Parade, on Friday, March 1, rolling downtown’s main thoroughfare, Palafox Place. Saturday, March 2, Pensacola’s largest annual parade, the Pensacola Grand Mardi Gras Parade, hits the streets in the afternoon and is known to take up the entire afternoon, drawing tens of thousands of spectators. Sunday afternoon, March 3, the fun rolls out to Pensacola Beach for the Krewe of Wrecks Parade down Via de Luna, which is often the wildest of the three parades. Parades plan for a family friendly atmosphere, and Pensacola’ nearly 100 krewes are known for their generous throws, so bring a big bag and be prepared to shout, “throw me something, Mista!” You won’t leave empty handed. Monday, March 4, the Krewe of Wrecks serves a massive traditional red beans and rice luncheon on Pensacola Beach, which will fuel you up to wrap up Carnival season on Fat Tuesday, March 5. Pensacola Mardi Gras Inc. is planning a new Fat Tuesday celebration this year, moving away from the traditional pub crawl to a concept involving “pop-up” parades in downtown Pensacola. Most places, Fat Tuesday is meant to mark the end of Carnival and the beginning of Lent, a period of abstinence from … well, from a lot of enjoyable things. 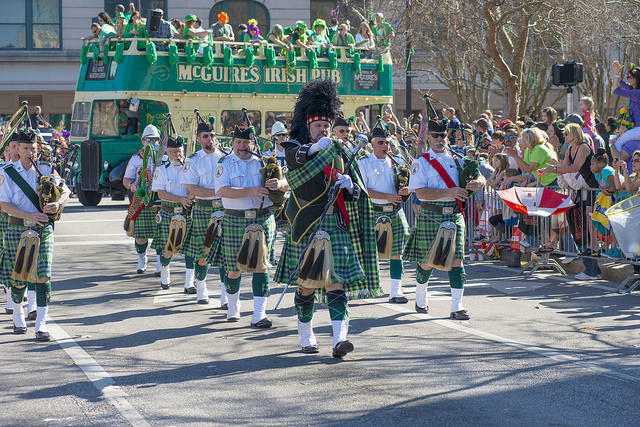 But with St. Patrick’s Day right behind it, an exception is in order, because Pensacola’s St. Paddy’s Day celebrations rival the best in the land. The biggest party of them all actually takes place a week before Patrick’s sainted day, on March 9, as McGuire’s Irish Pub, known far and wide as the home of “Feasting, Imbibing and Debauchery,” presents its annual 5K Prediction Run. If running doesn’t sound fun to you, you’ve never done this run, which is really just an excuse for one of Pensacola’s biggest and best parties. While there are prizes for the folks that are there to show their speed, it’s really just about getting to the finish line. In a “prediction run,” it’s not your speed that counts, but your accuracy, as you’re competing against your guess as to how long the run will take you. Whether you win or not, the rewards definitely await you at the finish line, with a massive celebration fueled by green beer, Irish Wakes, whiskey, soft drinks, live Irish music, costume contests and plenty of tasty Irish stew. St. Patrick’s Day itself is also not to be missed. “Go Irish on the Island” for Pensacola Beach’s biggest annual pub-crawl, a daylong march across a dozen beachside watering holes and dining spots. In addition to the pub-crawl, Paddy O’Leary’s Irish Pub on Pensacola Beach presents a day-long celebration including live music inside and outside, a reenactment of Tim Finnegan’s Wake and even appearances by St. Patrick himself, into the wee hours. Back in town, O’Riley’s Irish Pub is well known for its own St Patrick’s Day blowouts at its two locations, downtown and 321 Palafox Place and “uptown” at O’Riley’s Uptown Tavern, 3728 Creighton Road. Traffic comes to a halt in downtown Pensacola on March 23 for Ciclovia Open Streets. Downtown streets close to vehicular traffic for most of the day, allowing for a huge community gathering. Walk, run, bike, skate, hop and/or dance through the streets as the community comes together for Pensacola’s biggest block party, part of a worldwide trend begun in the 1970s in Bogota, Colombia. During the street closure, downtown will be peppered with fun and activities including live music, vendors, kid’s events, health screenings and much more. The event promotes healthy living and exercise as well as meeting new people and enjoying the best that the downtown community has to offer. Baseball returns to Pensacola’s gorgeous Community Maritime Park when the Pensacola Blue Wahoos return to Admiral Fetterman Field at Blue Wahoos Stadium on April 10. Repeatedly named one of the top minor league fields in the country, the stadium itself is a sight to see, with a stunning view of the bay and gourmet concessions among the amenities. The Wahoos enter the season with a new Major League Baseball affiliation, moving to the American League to become part of the Minnesota Twins organization. Visit milb.com/pensacola for more information on tickets and scheduling. 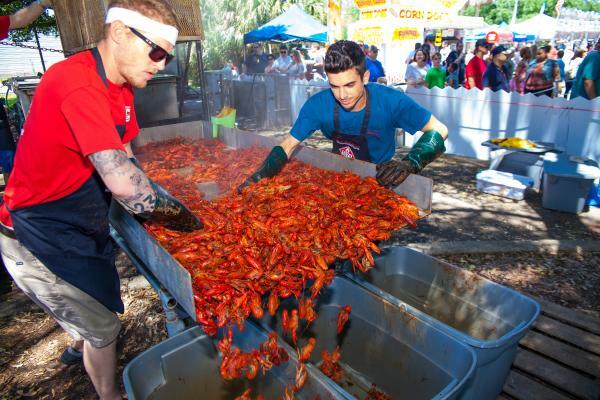 Pensacola goes mad for mudbugs at the end of April, as the three-day Pensacola Crawfish Festival takes over Bartram Park in downtown’s historic district. How mad? Well, the centerpiece crawfish boil serves up more than 16,000 pounds of the Southern delicacy, filling a massive pot with potatoes, corn, sausage, spices and, of course, plenty of crawfish. If you’re not up for pinching the tail and sucking the head (that’s how you eat a crawfish, if you didn’t know), there’s plenty of other food available, some of which doesn’t even have crawfish in it. The weekend also features plenty of great live music, kids activities, crawfish eating contests and yes, even crawfish races. Perhaps the most uniquely Pensacola event of the year happens at the end of April, when we gather on the beautiful shores of Perdido Key to throw dead fish at our neighbors in Alabama. The Flora-Bama Interstate Mullet Toss is really an excuse for a truly epic beach party on the sugar-white sands of Perdido Key, directly behind the iconic Flora-Bama Lounge, a legendary roadhouse immortalized in song by Kenny Chesney, who memorably played his only 2014 concert on those same shores. The rules are simple: You stand in an appointed circle, grab a dead mullet (the fish, not the hairdo) out of a bucket, and toss it with all your might across the state line into Alabama. There are prizes for the longest throw, and all fish flingers get a T-shirt. Don’t worry if tossing fish doesn’t seem like your thing, though. 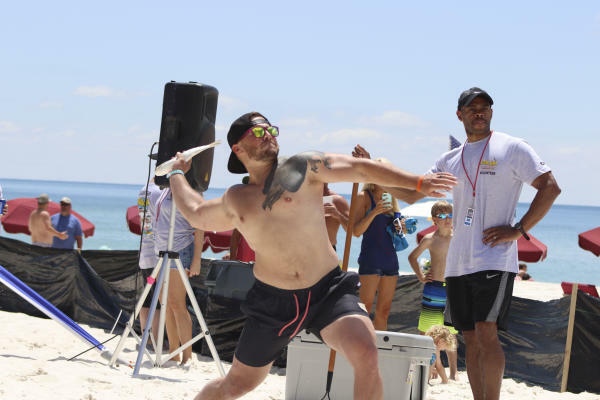 The event features tons of live music across multiple stages, bikini and male hot body contests, food and drink specials and lots of other fun, as well as time on the world’s most beautiful beaches. What’s not to love?